The following picture has been a popular pick for about two seasons in our wedding market. It is very classic and seems simple and somewhat understated in design. First of all, this is a gorgeous design. We wish we could do this, as pictured, every time a client brought it to us. What’s difficult to really focus on in this picture is how much real estate is being taken up by this centerpiece. It’s a pretty large footprint and, therefore, involves at least five vases that we can see/count. Just the glassware puts this out of some people’s price ranges. But how would anyone who isn’t in the business know that? As we continue on, there are four or five types of flowers seen, one type in each vase. 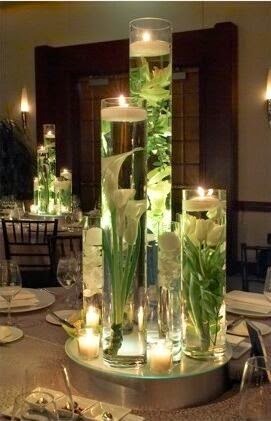 These types include tulips, full stems of orchids, and calla lilies. These are the perfect flower choices for submerging as not all blooms are submersible. Calla lilies and orchids are higher-end blooms and can be price-y, especially in the quantities we see here. Let’s do some general pricing for just the flowers. A very conservative estimate would be that each vase contains between $15-100 (retail) of flowers depending on the type and stem count. So, for our purposes, we are going to assume around $40 of flowers per vase. This figure multiplied by five is easily $200, just for the flowers. Some vendors may rent you vessels, others may want you to purchase them. Either way, vases of that height and shape are not found every day at the discount dollar store and will certainly add to the overall price. Something else to consider is just how many gallons of water (added labor cost) it will take to fill these vases. We have LOTS of stories about this! 🙂 Another time…….. This is all a lot of information, but the take away is this- you don’t know what you don’t know. We never fault a client for not knowing how to price any of the inspiration pictures they bring us. Pricing and figuring the designs for clients is our job. A good designer can take a client’s vision, likes, and dislikes and come up with an idea that encompasses the important elements within a reasonable budget (see our previous blog about budgets). Because the pictures you fall in love with may have costs and elements that you are unaware of, just be willing to give a little and listen to your professional vendor on ways to make it happen for you! Look for another installment of “Inspiration Pictures from Pinterest” coming soon!